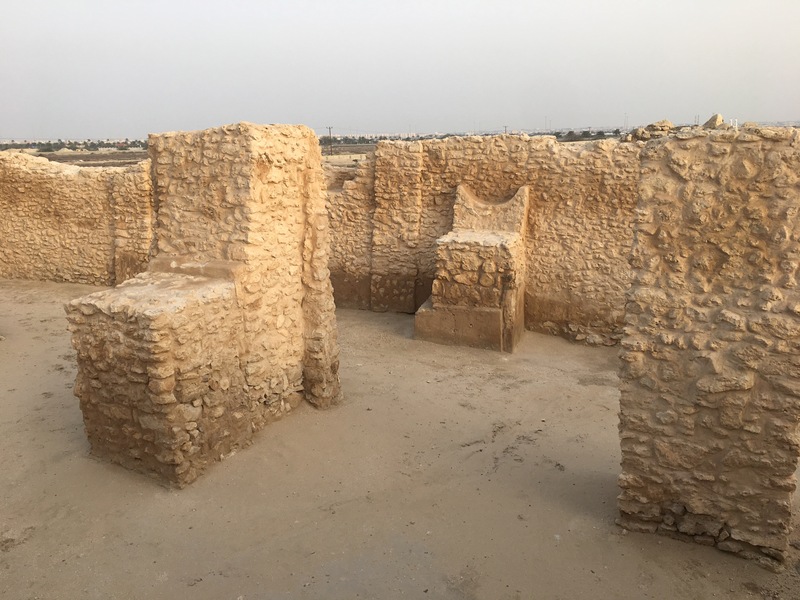 Bahrain could have been an archeological treasure trove. 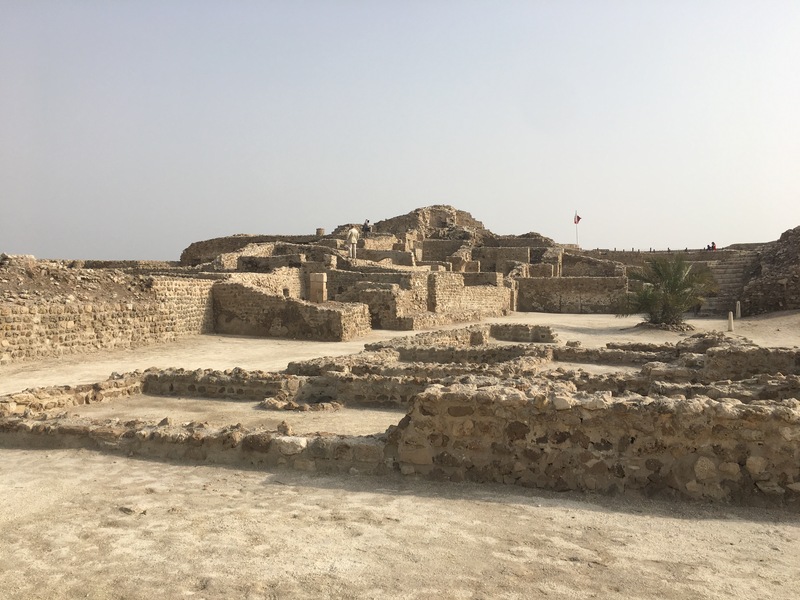 An old civilization called the Dilmun inhabited Bahrain (record shows their existence as early as 4,800 BC). References to these ancient people have been found in the Sumerian records from the nearby Iraq, then known as Mesopotamia. Bahrain has always been a strategic location for trade. The pearl industry was one of the driving force since the ancient times. Unfortunately, the Dilmun themselves did not leave much records behind. No one knows what their architecture looks like nor their people and customs. Then came the Tylos (they were sent by Alexander the Great and overtook the locals at the time) on the island, and after that in later times the Portuguese controlled the trade flow in the region, the British, and the current ruling Monarchy (they are said to be related to the Saudi monarchs) came into power relieving Bahrain from being part of the British Protectorate. 1. 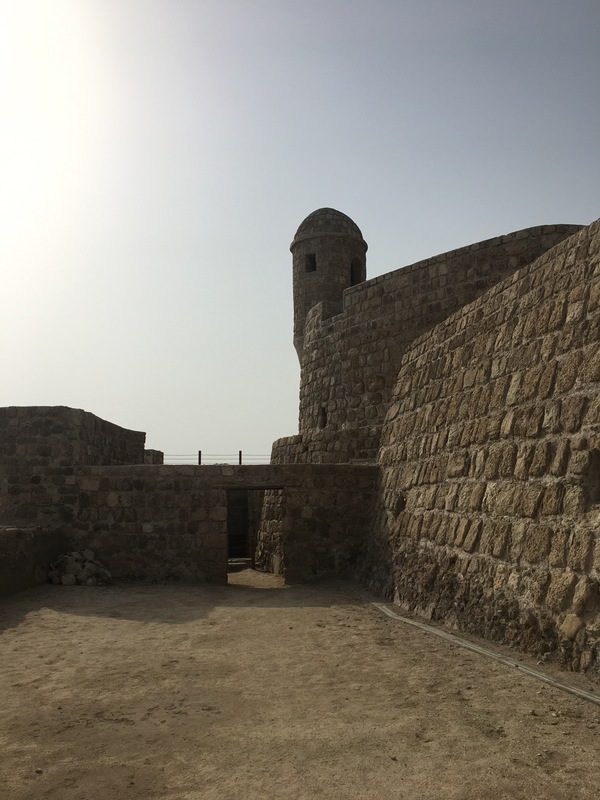 Qalat-Al-Bahrain (Bahrain Fort). This fort was rebuilt by the Portuguese from the earlier Dilmun and Tylos ruins. One can see the mix of stones used to rebuilt the fort. Some of the strong wall base is from the Dilmun era. Wall of the Qalat-Al-Bahrain reconstructed by the Portuguese using all sorts of stones. Some even light corals taken from the sea. 2. Saar Ancient Settlements and their Mass Interconnected Tombs. This is my favourite spot. We took our time walking the settlement. Losing ourselves imagining how these ancient people lived. The remains of the temple is interesting with its solar orientation and the altar chair. The mass graves are also a big mystery because they are very different to the typical tomb mounds found in Bahrain. Unfortunately, it is also a questionable practice of archeological excavation. The tombs were circular and adjacent to one another. The excavation was done rectangularly. I am not an expert, but that sounds like a botched job. I still enjoyed the site though. Two altar chairs in the Temple at Saar archeological site. One has interesting half-moon design. 3. Remains of Barbar Temple. A lot of imagination is needed when one visits the Barbar temple ruins, but one can see three different foundations of the temples constructed in three different time periods (video below). The highlight of the temple is the worship pool, but the jar that used to be there has now disappeared. The most famous find is the bronze head of a bull that is now housed in the Bahrain Museum. The worship pool at the Barbar temple. 4. Village of A’ali (famous for their pottery) and the Tomb Mounds. These tombs are scattered all over the village with local houses and sometimes, loos built right smacked on some of them. The biggest offence are the kilns built on the mound themselves. The local people has no respect for their own history and heritage! It is quite shocking. 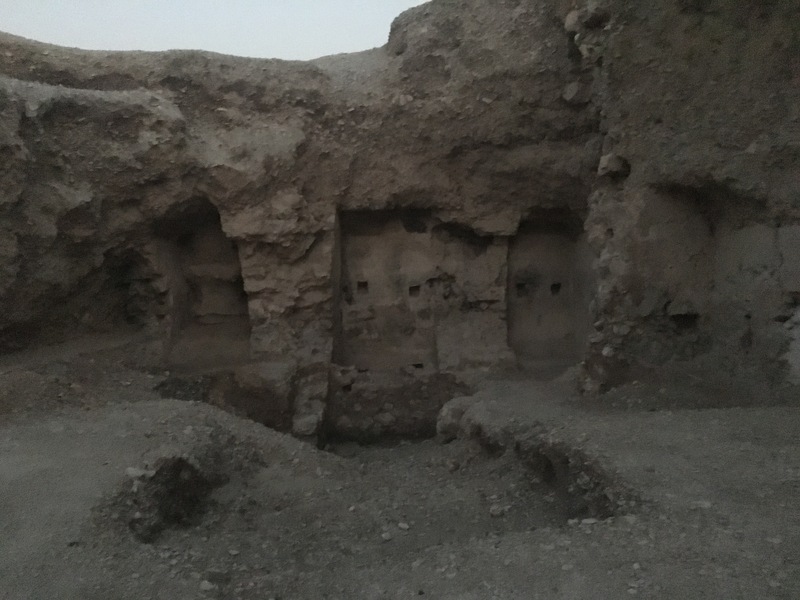 A series of kilns on the side of the tomb mound in the Village of A’ali. Seeing my concerns for archeological site preservation in general, my local guide asked me to climb one mound and showed me the grave (pun-intended!) destruction of this particular tomb mound by British soldiers with dynamites. I was quite outraged. What a sad state these sites are in. One of the tomb mounds destroyed with dynamites by the British soldiers. 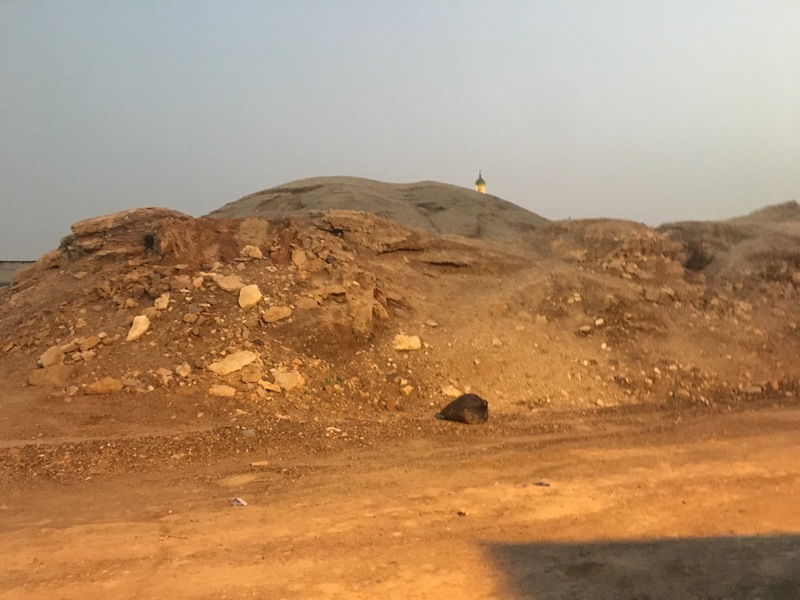 The tomb mounds are scattered all over Bahrain (you can see them while driving around the Northern part of Bahrain) and modern houses are built around them. I would not be surprised if many have been destroyed to make ways for modern buildings and roads. 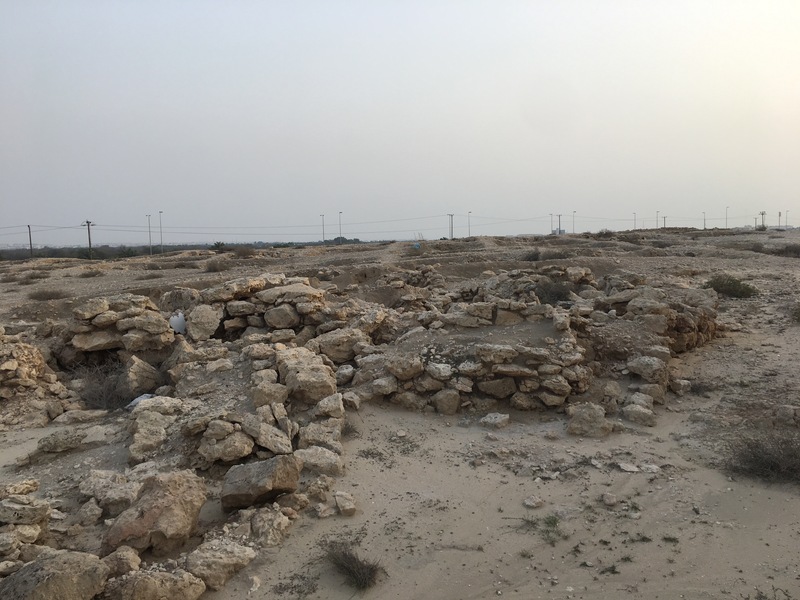 Ironically, after letting some of this sites to their current sorry-state, the Bahrain government made the year 2017 as the Year of Archeology. I am afraid this is is a little bit too late and is nothing but a superficial campaign to drive tourism. Much of the archeological treasures in Bahrain have been desecrated and destroyed. Stones have been stolen and reused (I was told even now after the site is fenced in). And as told above, dynamites were used in exploration and kilns are made on the tomb mounds themselves. I asked someone why the Government never bothered to do anything before. This person believes that because the ruling family came from Saudi Arabia and they have no connection to the Dilmuns or the Tylos, thus, they have zero interest in preserving what is left of these ancient civilizations. I will sound very critical, but by looking the visitor centre at the Tree of Life and at the Berber Temple ruins, the effort that has been put in is kind of half-hearted efforts. Whatever the original motivation (one can only opines and speculates) to not preserve these archeogeological treasures, I am afraid they are a bit too late now, unless they commit significant resources quickly and invest in educating their own people on the values of these sites. It’s even worse than that. 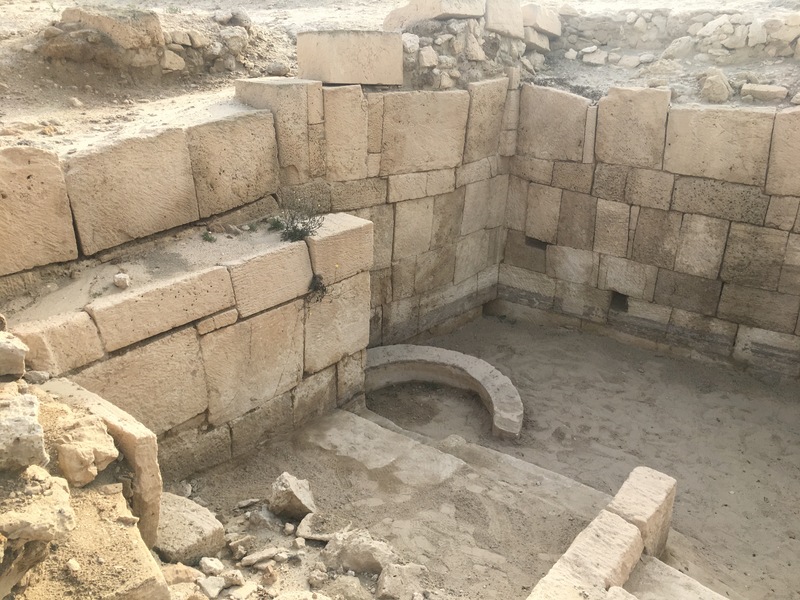 There are multiple stories of people discovering archeological artefacts in their gardens and calling the Hey’a (the Bahrain Authority for Culture and Antiquities) only for them to take it and for it to disappear without a trace. When people call to ask about it (Why is it not in the museum?) they are told that the Hey’a did analysis on it and it turns out to be nothing but trash, not an artefact, not old, etc. “Okay, can I have it back?” – No, sorry, it was thrown in the trash. “We don’t hold on to trash waiting for you to pick up.” How convenient. Hi Ahmad. Thank you for sharing. That is very sad indeed. It is important for us to remember where we come from.